Fluoride (F) and Chloride (Cl) are associated trace element / mineral pairs considered essential to human health, although there is still controversy among some authorities in regard to the essentiality of fluoride and its value in human nutrition. 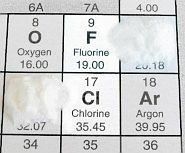 Fluorine is a hardening component of bone and it is present at about 4% as calcium fluoride. Too little has a weakening effect on bone, while too much fluoride causes brittleness of bone and thus increases fracture rates. Fluoride is absorbed through the gastrointestinal tract, however just as with chlorine, another route of absorption may be through inhalation. Nearly all the fluoride of soluble compounds such as sodium fluoride may be absorbed when ingested with water, although the hardness of water has some effect on fluoride uptake -- e.g. a high calcium or magnesium content, or the presence of high levels of aluminum will reduce the bioavailability of fluoride. Approximately half the absorbed fluoride is excreted in the urine, while most of the retained fluoride becomes part of bone and other calcified tissues. However, a reduced fluoride intake over a long period of time will result in mobilization of bound fluoride from storage sites, and subsequently lower concentrations in bone. Much of the controversy surrounding fluoride comes from its legislated addition to city water in many municipalities in an effort to reduce tooth decay in children. There are clearly two very divided camps arguing for and against the benefits of fluoridation of municipal drinking water, with one side claiming a 30% -70% reduction in tooth decay and reduced fractures with osteoporosis, while the other side refers to research studies showing an increase in hip fractures instead, and proof that tooth decay declined as much in non-fluoridated municipalities as in the fluoridated ones, and that the use of fluoride supplements by pregnant women for instance offered no benefit to the baby. In addition, they argue that in certain regions, there is an excess of fluoride, which has resulted in mottling of teeth in children, and that numerous studies have implicated high fluoride intake as being responsible for lowered IQ and learning ability. There are also fluoridated and non-fluoridated city to city comparisons, where statistics show thousands of cancer deaths attributable to mandatory fluoridation of public water systems. IQ: Recent studies emanating from China have claimed that children exposed to high levels of fluoride have lower IQ's than children exposed to low levels. The two studies claiming such an effect are deeply flawed and provide no credible evidence that fluoride obtained from water or industrial pollution affects the intellectual development of children. Cancer: The few studies published during the review period do not challenge earlier research showing that there is no reason to believe that exposure to fluoridated water increases the risk of cancer in bones or other body tissues. While an ecological study did suggest an association with uterine cancer, the limitations of this kind of study in terms of linking exposures and outcomes in individuals, mean that it does not contradict the evidence derived from more systematic and scientifically credible case-control studies. A 1990 fluoride study suggested an increase in cancers  of the oral mucus membranes (squamous cell carcinoma) in rats; a rare form of osteosarcoma appeared at double the rate in males as females; and there was an increase in thyroid follicular cell tumors, and liver cancer. However, a 1991 review by the U.S.Public Health Service concluded that there is no evidence that fluoride causes cancer in humans. The incidence of bone cancer in males below the age of 20 has risen since 1973, but the panel concluded that this is not related to fluoridation. Chlorine exists primarily as the chloride anion that joins with cations such as sodium to make salt (table salt, or sodium chloride), and with hydrogen to make stomach acid (hydrochloric acid), but while chloride is a constituent of stomach acid, high or low chloride levels are not an actual indicator of stomach acid levels. It is necessary for protein digestion (pepsin), Vitamin B12 absorption (intrinsic factor), and absorption of metallic minerals. When stomach acid is neutralized, chloride is reabsorbed by the intestine and recycled. Being one of the electrolytes, chloride works closely with sodium and potassium and is part of the controlled regulation of acid-alkaline balance. Heavy perspiration can cause a considerable amount of sodium chloride and potassium to be lost. Chlorine is used in treating drinking water, swimming pools, hot tubs...etc, to kill bacteria and other microorganisms. It is also a building block for PVC (polyvinyl chloride) and numerous other chemicals such as antifreeze, pesticides, refrigerants, and anti-knock compounds. As sodium hypochlorite, or bleach, it is widely used as a disinfectant and in bleaching. Mixing bleach with other cleaning agents, such as ammonia, can expose children or the elderly to dangerous gases. Some studies claim that more than half of our harmful exposure to chlorine is due to the inhalation of steam and skin absorption while showering, with the steam containing up to 50x the chemical levels compared to drinking water, and with chlorine and most other contaminants vaporizing faster and at a lower temperature than water. In addition, inhaled chlorine gas (chloroform) goes directly into our blood stream, subsequently bypassing the kidneys and digestive system where it would be partly filtered out. There is also much concern about the levels of residual chlorine in drinking water, because excess chlorine is thought to combine with certain organic water pollutants to form toxic chemicals and carcinogens such as trihalomethanes. Several epidemiological studies, including research from the National Cancer Institute and 10 other organizations linked the chlorination of drinking water to increasing an individual's risk of developing bladder cancer, with some of the studies  also claiming a higher incidence of Hodgkin's disease, colorectal, esophageal and breast cancer. According to these claims, women with breast cancer have 50 - 60% higher levels of organochlorines (chlorination byproducts) in their breast tissue compared to women without breast cancer. Chlorination has also been associated with declining sperm counts, male infertility, and circulatory disturbances based on some animal studies. Fluoride & Chloride interact with some Carotenoids (beta-carotene), whereby sufficient intake of these carotenoids positively affects the absorption of both elements. As a result, and considering the widespread use of fluoridated toothpastes, supplementation of fluoride for children in the form of drops or chewable tablets (such as Fluor-A-Day) to reduce cavities is not necessary or advisable. Low levels of fluoride and/or chloride tend to adversely affect bowel functions and sinuses, resulting in greater incidences of inflammation and congested sinuses, so adequate carotenoid intake (including lutein, for macular degeneration) is important for preventive or corrective purposes. High levels of fluoride and/or chloride can trigger ringing / noises in the ear (tinnitus), and may eventually lead to progressive hearing loss. No extra beta-carotene should be supplemented in those instances, but only preformed Vitamin A, if deficient. When Potassium Supplementation is indicated, the use of non-chloride types such as Potassium Citrate (K-Lyte) may be preferable for better tolerance, or where specific medical situations, such as osteoporosis, polycystic kidney disease, or kidney stones may be aggravated by the use of Potassium Chloride. On the other hand, individuals on a salt-restricted diet and a tendency for low stomach acid may do better with chloride-types of potassium (Slow K), or chloride-types of other minerals they supplement. Best time to take Fluoride: At bedtime, when takenas lozenges. Tablets: with, or without food (no dairy). Best time to take Chloride: Morning and evening, if taken as sodium chloride (for infants / children). Fluoride Synergists: Carotenoids, Vitamin D, vanadium, stomach acid, black tea, chloride*. Chloride Synergists: Carotenoids, molybdenum, fluoride*. Fluoride Antagonists / Inhibitors: Iodine, calcium, magnesium, aluminum, chloride*, molybdenum, protein, milk. Chloride Antagonists / Inhibitors: Tin, calcium, magnesium, bromine, fluoride*, vanadium. Low Fluoride: Weakened bone, dental caries. Low Chloride: Metabolic alkalosis, apathy, dehydration, In children: slowed growth, delayed speech. Chlorine inhalation: Coughing, choking, chest pains, pulmonary edema, asthma, headache, blue discoloration of skin, nausea, vomiting. Fluoride Sources: Seafood, gelatin, black tea, tap water (some cities), some mineral waters, most toothpastes, pesticides, chewing tobacco, tamarind, some wines. Chloride Sources: Salt, sea salt, vegetables, celery, tomatoes, olives, lettuce, salt substitutes (KCl).